Posted on February 8, 2019 by Ellen •	This entry was posted in Fave Five on Friday, Addyson May and tagged Addy 22 Months Old, Alistair Begg, Friday's Fave Five, Grace to You, John MacArthur, Snow, Truth for Life. Bookmark the permalink. Hello, adorable photos of Addy! Happy Friday, enjoy your day and weekend! A week to remember, thanks for sharing. Ellen, so nice to ‘see’ you again on my blog! I just love that first photo with all the snow. It looks like a fairy garden. 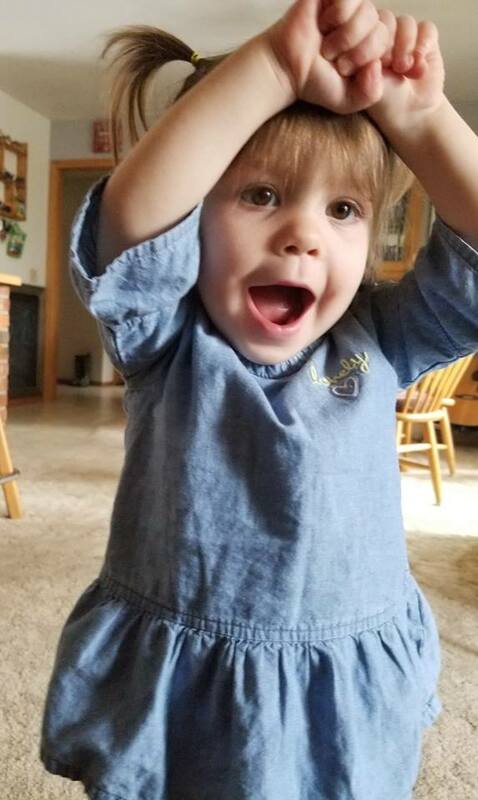 Such sweet photos of your granddaughter, too:) She’s adorable. Handwritten notes are such a treat, and getting them through the mail doubly so. Enjoyed your favorites. Have a good weekend! Me again:) I often have trouble commenting on WordPress blogs. I think it’s because I had a wordpress account at one time, and I just can’t seem to delete it. Anyone have any ideas on how to fix this? I’m at http://overbackyardfence.com. OH geez. I’m sorry to clutter up your comment space!! It’s http://overbackyardfence.BLOGSPOT.com. Ellen, thank you. At least I know I’m not missing an obvious solution. I will keep muddling through! …she sure is getting BIG. Ellen, it is so good to have you join us here! 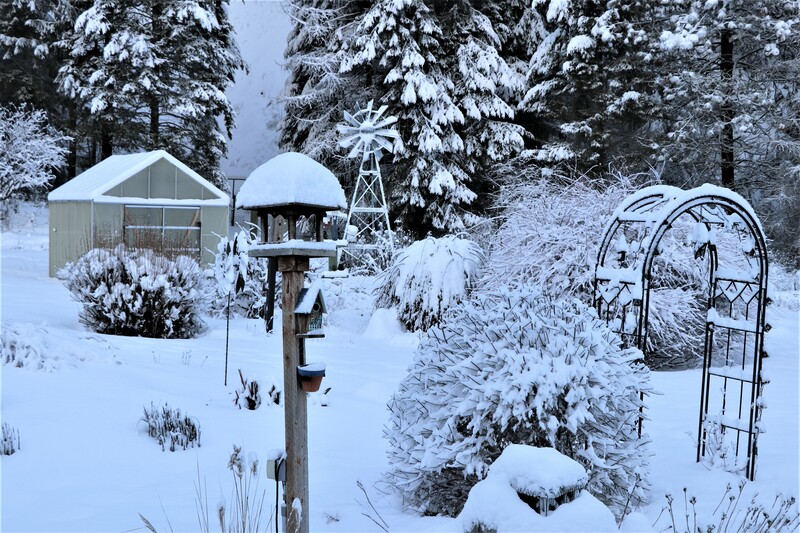 I loved your snow picture of your back yard. It all looks lovely. Glad your vehicle goes well in the snow and I like your ideas for your next car…especially the heated seats. My sister-in-law has those in her Nissan pick-up and they are so nice! I have to agree with you when it comes to John MacArthur. I’ve not listened to Alistair Begg yet, but he’s on the list. 🙂 How special that you actually attended Grace Community Church when you were first married and lived in that area! Nice to see you here and your Addy is very cute! They change so quickly at that age, doing something new every week it seems. Your snow looks very pretty but I’m glad we don’t get that sort of weather very often. A suitable car is definitely a must for you but I like your ideas for your next one lol. Have a good weekend. it was nice to have you visit my blog again!! Your granddaughter is so cute!! Your fresh snow is so pretty. Ours is almost gone and i m actually kind of glad. I’m longing for spring. 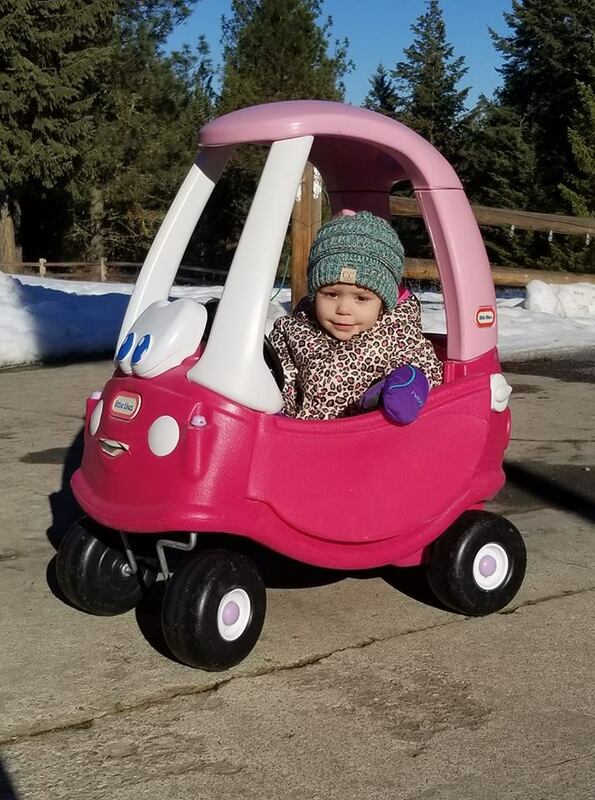 Addy is so cute in her little pink car. She must do well in the snow. Yes, snow makes everything beautiful. Posts like this are fun to read . . . little snippets of everyday moments! I am sure that heated steering wheel and seats would be valuable features in your new corner of the world! Love (as always) the pictures of Addy! She is darling and growing up so much! Potty training is a big deal! So is a handwritten thank you note! Since I am in Dallas I read comment #4 to Hope. You would have loved the smile on her face. Glad you shared with Hope! It’s snowy where you live now! Do you enjoy it or are you finding it a hassle? It’s cool that you and Dear first went to church at John McArthur’s church. Jody, snow is different here on the northeastern side of Washington. We have roads that are regularly plowed and the roads for us to get to services are all relatively flat so it’s not scary to drive. Seattle area is always a nightmare because of all the hills…hills everywhere. Slip sliding away is the theme for Seattle. I’m enjoying the fact that snow won’t paralyze us here. Grace Community was a great place to start our married church experience for sure! So good to see you at FFF again! We don’t get as much snow, but my husband loves the respite from lawn work this time of year. How good that you could get your wedding rings resized! I need to check into that. What a sweet little granddaughter! My grandson has that car but with a yellow top. What a blessing to start off your lives together with good Bible teachers. We had some snow but only for two days and then went back into the rain again ! My wedding ring still fits but Mr. G’s fingers became thicker and it had been cut off when he had a surgery. Since then his finger is “naked” ! Receiving ‘real’ thank you notes is truly a favorite! Wow, all that snow–I’ve been seeing your posts on facebook too and yeah, you’re getting lots of snow. No yard work–except snow shoveling. Addy is growing so quickly! I’m sure you are thankful to be near her and watch her grow. Snow for you is a bit like rain for us — postponement of garden chores. I’d just heard about John MacArthur’s anniversary, too. Amazing ministry. I’ve used many resources from his old sermons.